Fiorella's Closet: Thank you! and ... Boo! My Halloween Giveaway! Thank you! and ... Boo! My Halloween Giveaway! I hasn't been long since I started blogging, but thanks to this little space I've come to "meet" some wonderful people who share my craziness passion for nail polish! Well to celebrate all of that + Halloween is coming to town! haha I want to do a giveaway!!!!! This time I will only be able to ship to a US address (if you are outside of the US you can still participate as long as you give me a US address to ship to if you win). 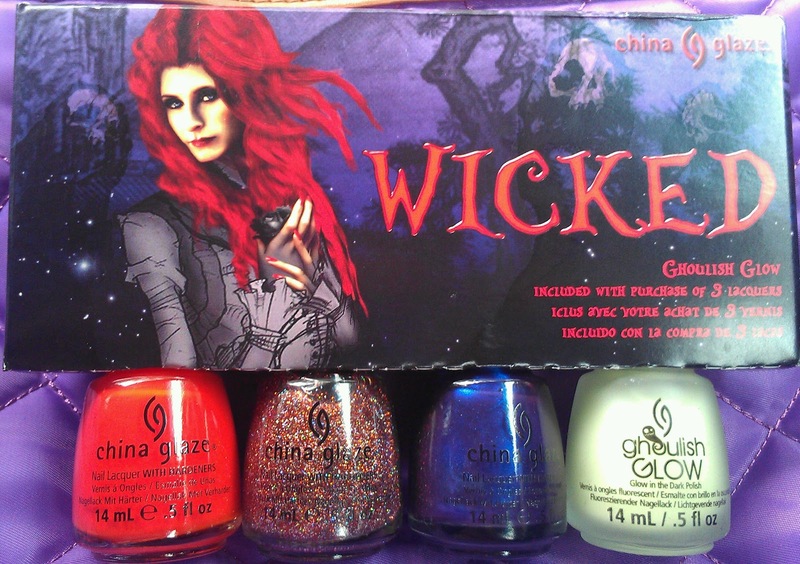 This Giveaway closes Saturday October 20th so that you get these babies on time for Halloween!!!!!!!! Venique "Deviant Little Sneaker", Orly "Monster Mash" and "Right Amount of Evil", Sally Girl "Black", "Orange" and "Glow in the Dark"
You need a closer look!!! I'm so glad I got a set for myself and a set for this giveaway!!! What are you waiting for? Enter now!!!!!!!!!! UPDATE!!!! I promised I would add a second prize if we got over 1000 entries and you guys did it!!! So here is the second prize!!!!!!! Excited yet??? So excited for Halloween! Awesome giveaway!! I think I might be Hello Kitty again this year! I will transform my nails rather than a costume lol..frankensteins and mummys so far! Thanks for this wonderful giveaway! I'm not sure if I will dress up, but have you seen the zombie pics on my personal facebook page Fiorella? They are great! Yes I have seen them! awesome!!! I love those two orly polishes, so hot! I'm not sure yet. I might try an angel or a Renaissance woman, or maybe just be me, lol. I'm Ashley pashley and I'm not dressing up. My lil puppy will be a bumble bee tho! I'm probably not going to dress up, but my step-daughter is going to be Draculaura from Monster High! 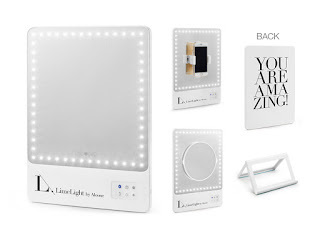 =) I have a giveaway going on my blog as well, you should come by and enter! Thanks for the chance! Dont know what to be for halloween this year but I am so glad you are having this awesome giveaway! This is really embarrassing, but... my friends and I are all dressing as characters from the TV show the Legend of Korra. Heck, it's dorky, but it least it will be funny to look back on years from now! Oh and I am not dressing up this year! My daughter is though. We haven't decided exactly. I thought a little pig outfit I saw was adorable but we dont know. Lol! My boyfriend and I are going as characters from Mad Men! Probably nothing. Lol... but we'll see. Not really sure what to call my costume--green & black corset, black skirt & heels, green sequins mask, black wig & hopefully what turn out to be AMAZING green & black blinged out nails! I'm too old to transform into anything!! A mountain man! I am knitting myself a hat w/ beard and wearing plaid shirt and jeans. I haven't fully decided yet, I'm always some form of cat, so I'm going to try to stray away from that this year. I'm thinking I'm just transforming my baby girl. She is going to be a ballerina! I'm a new follower by the way! I'm glad to have found you! My boyfriend & I are going as Dexter & victim. I'm not dressing up this year. I'm just taking my son trick or treating! :) I'll probably do some type of Halloween mani though. I plan to go dressed as a gorgeous WITCH\m/N ofcourse my nails would be dressed up too\m/Thanx for this give away ~! I'm probably gonna wear an old figure skating or dance coustome! i'm eternally a cat every year, cuz i NEVER seem to have money to buy a costume. every year. weird huh? lol. One thing easy- still making my kids costumes!! I actually haven't decided yet. I might go as a doctor. It's what I wanted to do last year but didn;t have extra money for a costume! I'm hoping I can do it this year. I haven't decided, I'll be going to class that day so nothing too weird. I'm leaning towards going as Babycakes from China, Illinois though. I'm probably not transforming myself, other than nail art, for Halloween. Mostly we're focused on decorating the front yard! Its our first year as home owners so we're having a lot of fun doing things we've never been able to do in an apartment. Beetlejuice and Lydia! That's what the hubby and I are doing. :-P Thanx for the giveaway! Ill be going as a zombie doctor! I'll be a cranky college student for Halloween. But I'm afraid that by being a hipster ironically, I'm being an actual hipster. I honestly have no idea! I've seen some awesome make up on pinterest though! Thanks for the giveaway! I'm gonna be a *itch! *I'm* not doing anything, but I think we might make my sister into Princess Zelda! Love your blog! I wish I was able to do awesome nail art! Oh and: I'm being a witch, my daughter a pink leopard and my baby boy wants to be a dino or mickey mouse! Lol they are just as obsessed with nail polish as I am. 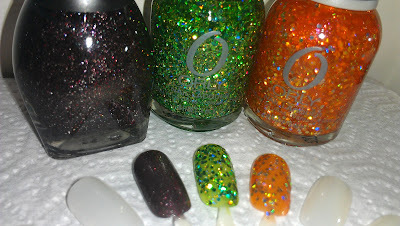 That Monster Mash by ORLY must be my favorite Halloween polish along with China Glaze Glitter Goblin. Great sets!! Thanks for the giveaway! I haven`t decided yet. I dont dress up for halloween but love to do fun nails for it!! I might be Jem but I need to get my girls to be the Holograms. Oh my what an awesome giveaway!!! Congrats!!! My kids are going to have a party instead of trick or treating so this year I will have to dress up!! I'm not sure what tho. I'm going as a Grecian goddess the dress has turquoise accents and I'm going to do turquoise ohmbre nails to match! I love Halloween!! 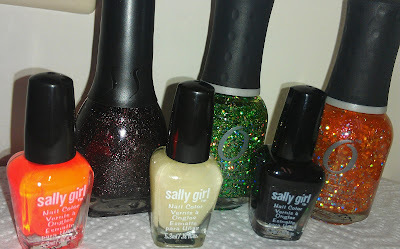 I'm really loving some of these glitters! Thanks for the giveaway opp! Probably going to dress up as the TARDIS from Doctor Who! Thank you for the giveaway and congratulations!!!! I think I'm going to be Coraline this year! :) Thanks for the giveaway! I love doing Halloween nails throughout the month for little "costumes." Last year I wore a yellow skirt, orange shirt and white headband for a sorta-candy corn costume, which will probably be about as dressed-up as I get this year! Thank you so much for this really cool giveaway! What an awesome giveaway! For Halloween I am dressing up as someone who doesn't spend so much money on nail polish LOL! I'm not dressing up for Halloween. Just taking my kids trick or treating. Into a suburban dweller who hands out candy, haha. I don't have any plans for a costume or celebrating. Just going to stay home. Most I'll do is Halloween nails. A mom passing out candy. We've got to get very creative since we're on a tight budget. I'm searching ideas for DIY costumes for myself and my husband. Still got to buy costumes for my kiddies. If I end up going out...I'll be Regina from Once Upon a Time. What an awesome giveaway! Just in time for Halloween =D No specific halloween costume yet, but considering a zombie or a ghoul, I have these white out contacts that are so spooky! Thanks for the giveaway love! No plans yet..trying to convince my boyfriend to be a silly couples costume, like ketchup n mustard. wish me luck! I might be a flapper girl .. or Katy Perry haha! I'm going to be a witch, it's not much of a stretch for me :) LOL! I'm not sure what I'm going to be yet. Hoping to find a funny couples costume for my husband and I.
I'm not a huge Halloween fan, but I have already enjoyed fall color manis including orange and yellow half moons, pumpkin nails, and currently a two-toned orange gradient. I'm thinking a witch or If I can get it together before then a lady Doctor Who or Sherlock. Ariel from the Little Mermaid! I will be working on Halloween! But I wish I could dress up!